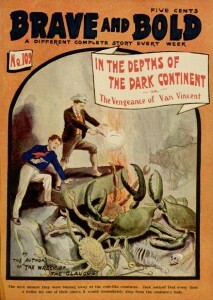 Our latest proofreading project is a work of early science fiction: In the Depths of the Dark Continent; or, the Vengence of Van Vincent. With a mysterious lost civilization and legions of horrible crab monsters, there’s plenty of action on display here! First published in the Golden Hours story paper, our copy is the version that was reprinted as part of the Brave & Bold series. The story was written by Cornelius Shea, about whom you can learn more in The Encyclopedia of Science Fiction. To help us create an eBook of this story by proofreading some pages, visit the project page. To learn more about how the proofreading process works, see this earlier post.